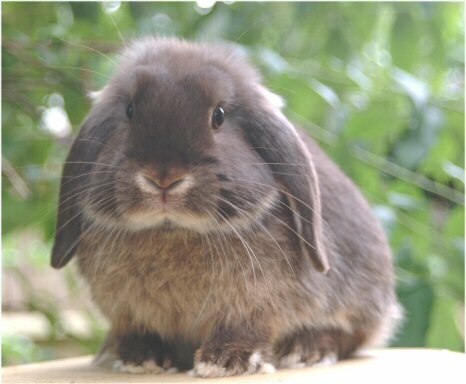 An event that really spurred me onto finally creating a web page is that after approximately 8 years of working with chocolate dwarf lops, Cadbury is the first chocolate otter dwarf lop to be a BRC Champion. His Silver Star Diploma came through in early December 2004. 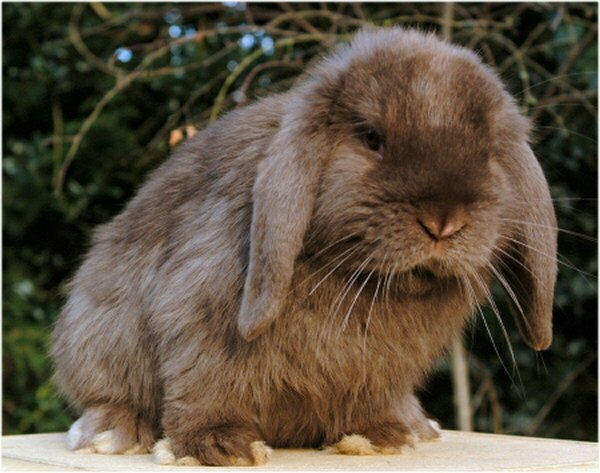 Due to his unusual colour Cadbury certainly created comment on the show circuit. This pages shows the progression of the chocolates, with updates being added at the bottom. I was lucky enough to find and buy 2 proven chocolate does. Exact backgrounds unknown, but one is a chocolate butterfly and the other a chocolate otter butterfly. 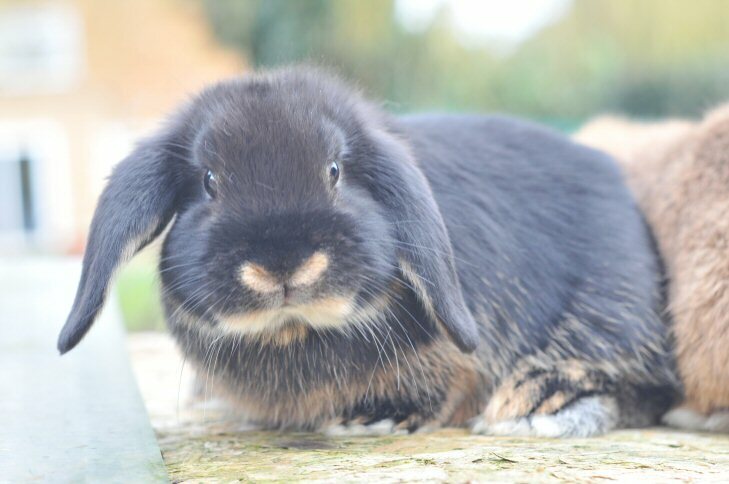 The fact they were proven chocolate dwarf lop does was good enough for me as I already had the bucks, ie Cadbury and his son Tallow, a black carrying chocolate. Young chocolate doe, Tulsa from Cadbury and my chocolate otter butterfly doe. 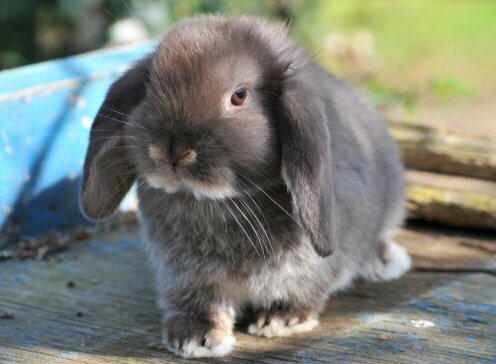 In order to improve the head, make it broader, she will probably be mated to Tallow as he has a broader head than Cadbury. As Tallow also carries the chocolate gene, I should have some chocolates in that litter. Whilst many colours are compatible with others for breeding, I have found that the chocolate gene is compatible with very little else to achieve the intensity and depth of colour I prefer. At first due to lack of chocolates I mated chocolate to blue, but ended up with almost a purple sheen on the coat. Mating chocolate to self black and black otters has given a deeper colour and the undercoat, the fur near the skin, tends to be darker, a good trait. 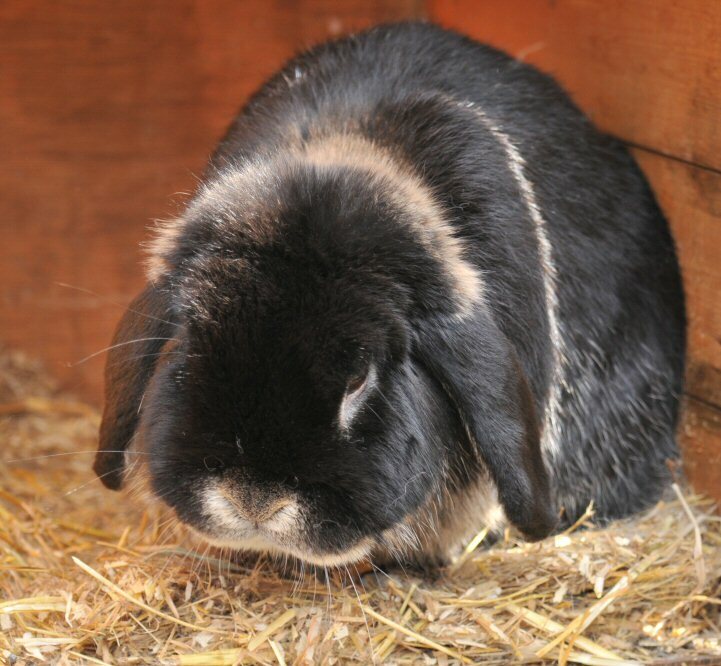 Unfortunately Tallow would not do very well on the show table as there are white hairs in his black coat and this is a serious fault for a ‘show’ rabbit. However as a breeding buck he was very useful, and again a real gentleman, loving cuddles and being very docile to handle. The quest for a bold headed, good typed chocolate continues. To help with this I am grateful to Sue Dickenson and her lovely buck Alfie. 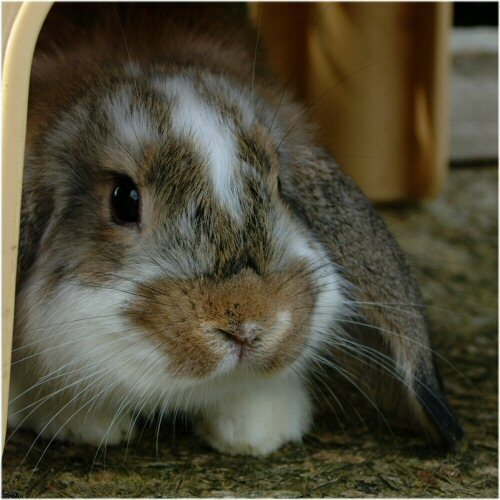 (Sue’s rabbit’s can seen at www.mapledurhamrabbits.co.uk). 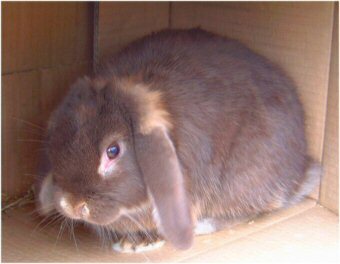 Alfie was mated to a chocolate butterfly and from this I kept an agouti buck. 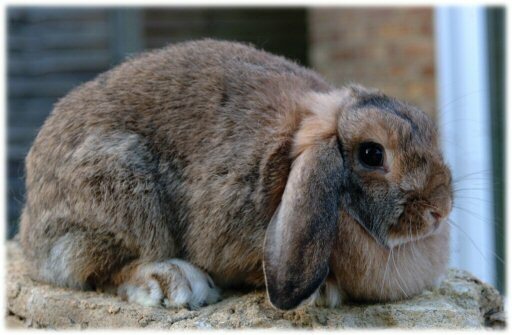 His grand-children are now being used in the 2007/8 breeding programme. Stepping out. Tulsa, now with her own litter. The self doe will be useful for both otter breeding, put to the agouti butterfly above, or for chin breeding, when put to the chin buck below. 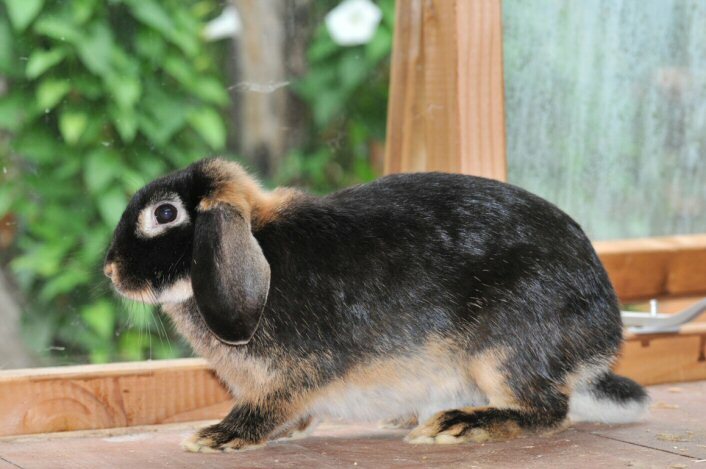 I can hardly believe it but the little chocolate doe in the photo called ‘Stepping Out’ is herself now a grandmother! This is Georgie. 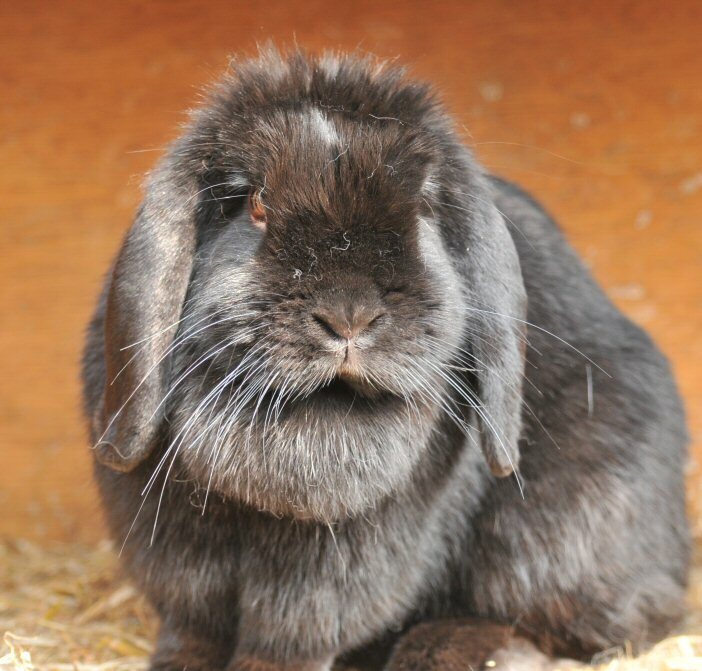 She is perfect for the chocolate breeding programme, a broad skull, very placid temperament and an excellent mother. From Georgie I kept the chin and agouti does below. Cinabun in 2006. Her and Tess are excellent mothers. 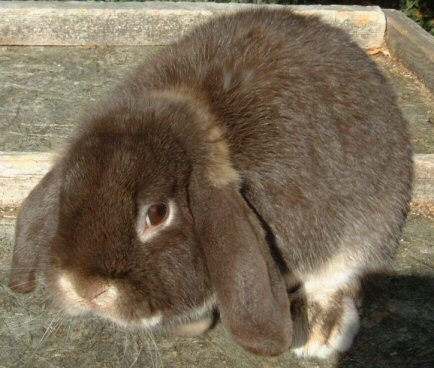 Sadly Cadbury died from a heart attack in the autumn of 2006 but looking around the shed his progeny are doing him proud. 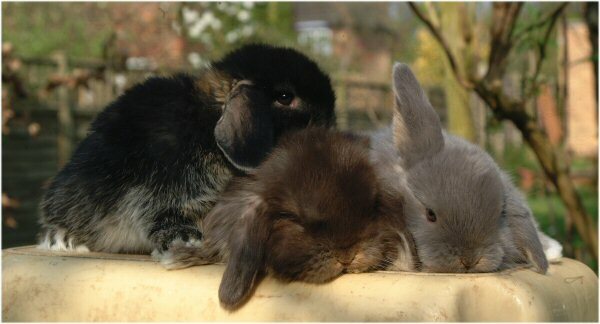 His last litter, below, are stunners, a lilac otter and self choc buck, who is complete showman. These 2 are litter brothers, from Cadbury (chocolate otter buck) x Takara, (self chocolate doe). Thanks to lots of advice about genetics finally the otters and foxes are appearing in nearly every ‘chocolate litter’. This litter is from a black otter carrying chocolate to a self chocolate doe, born in March. On Easter day another ‘chocolate litter’ arrived. The BEST type of chocolate!! Currently there are 6 in the litter. Here is the chocolate otter buck that I kept from this litter. A really nice surprise when the first litter from my imported orange buck, Bolly bred to a self chocolate doe produced 2 agoutis and 3 cinnamons. A cinnamon is a chocolate agouti so means this boy is carrying the chocolate gene. 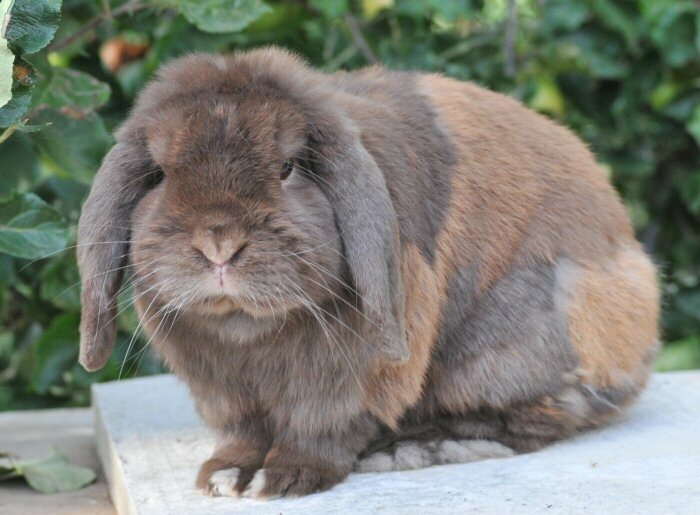 He was originally bought for his bright orange colour so to discover the chocolate gene is an added bonus. 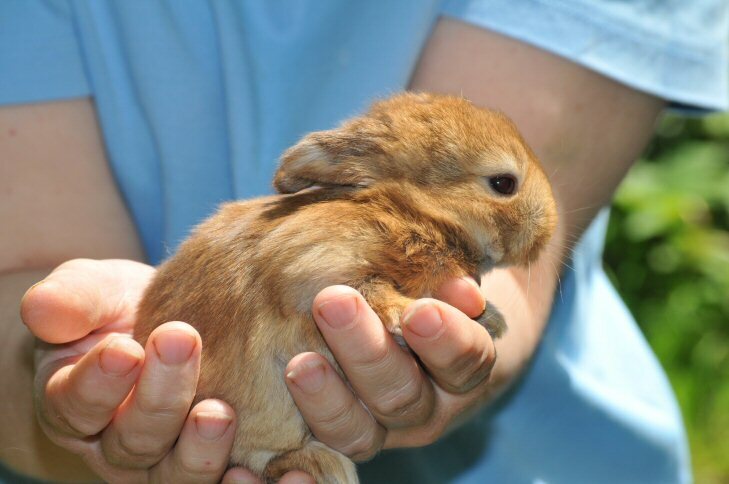 A cinnamon baby, 3 weeks old. 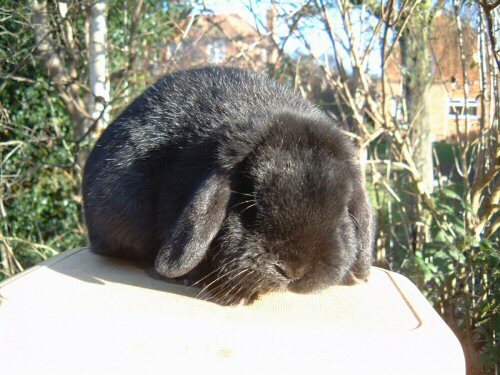 The first litter of 2009 contained this lovely girl. I am very pleased with the black otter particularly with the bright tanning (orange bits!!). The litter are all girls. My lilac otter also has a new litter. At last a chocolate otter. There is also a lilac otter and 2 opals in this litter. 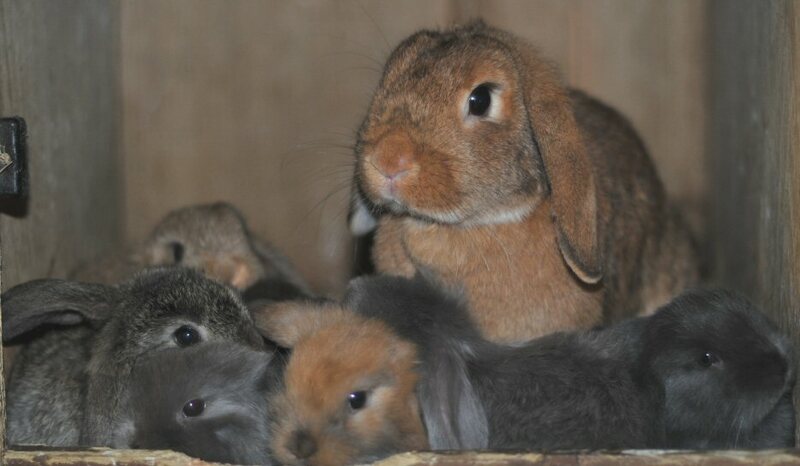 The biggest surprise of all, one of my smallest dwarf lop does producing and raising 7 babies. She’s a wonderful mother. 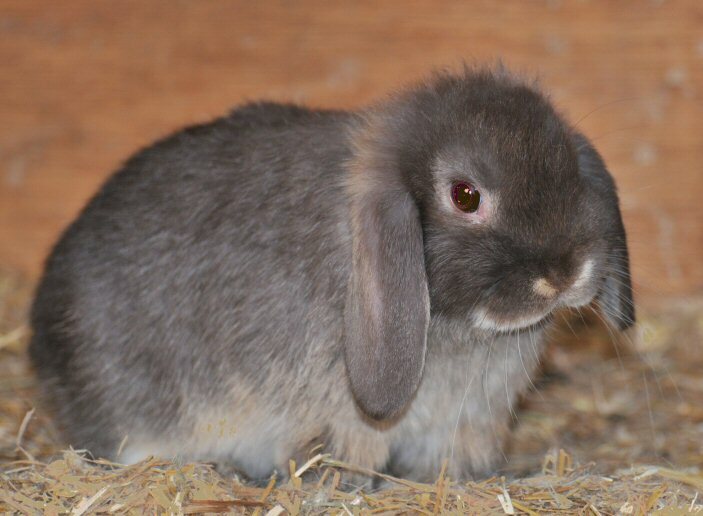 The colours in this one litter alone include agouti, sooty fawn, cinnamon, self chocolate,and blue. Here is Tandy, the baby in the photo 3 above. and here is her daughter. In order to increase the tanning (orange colouring) even more a buck and doe were imported from a Swiss breeder. 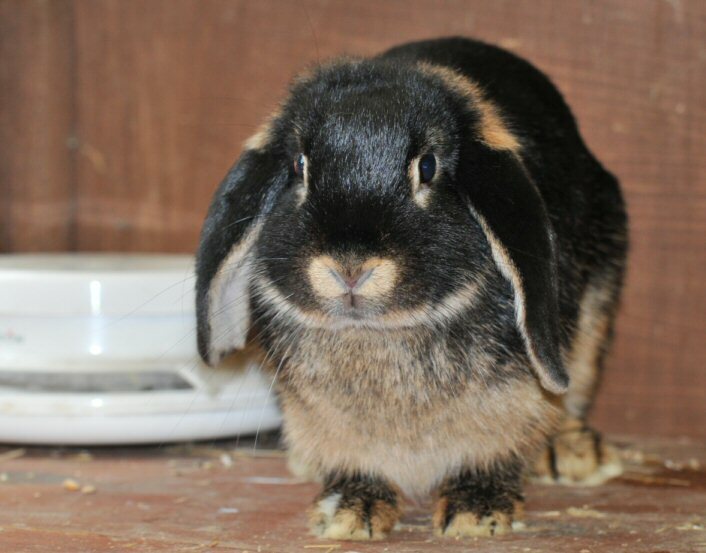 These were bred to a chocolate doe in the UK and here is one of the resulting does. 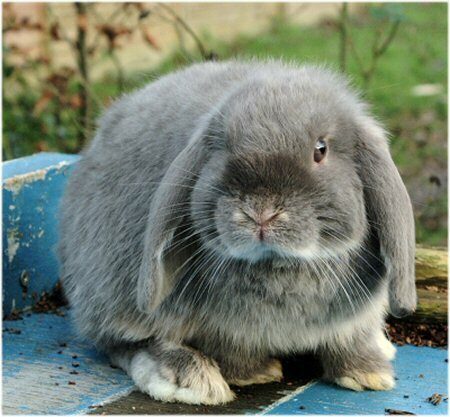 The type is different to the UK dwarf lop but hopefully in a few litters time the best of the two lines will be combined. Both this doe and her sister had their first litters in July 2010. One had 7 babies mated to a red agouti and the other 6 mated to a lilac otter. 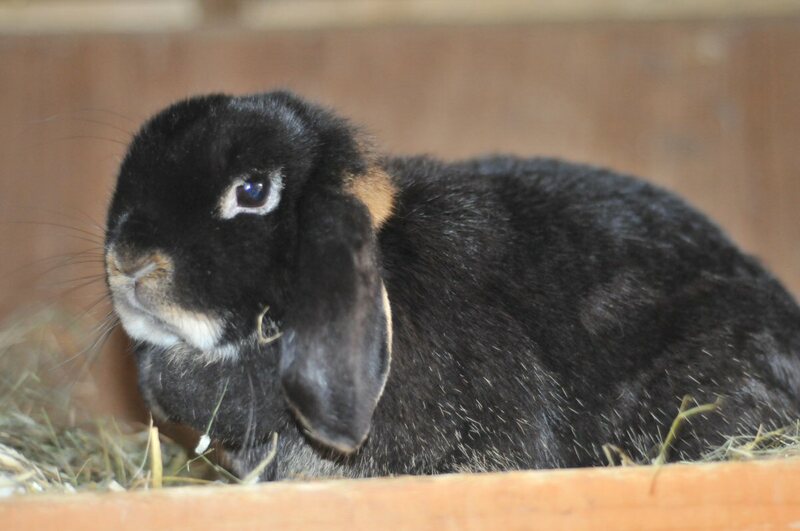 Litter from the high rufus black otter x red agouti buck. Born July 2010. 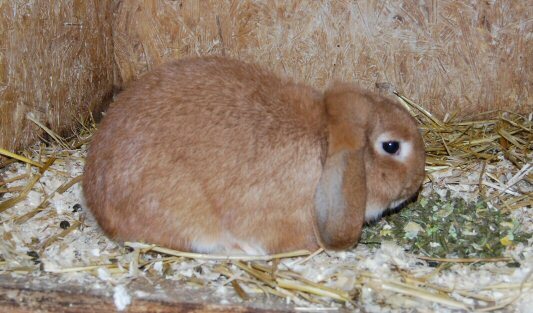 The bright orange at the back of the photo had her first litter in March 2011. During the summer one of original chocolate bucks, Toffo came back here for a ‘holiday’. Although he is in full moult in the photo his type is still stunning I think. Thank you very much to Julia. Still working on developing a good otter. Last year this black otter was bred here and will go into the chocolate otter programme to help improve the type further. This chocolate otter was born here in January from the black otter’s daughter. 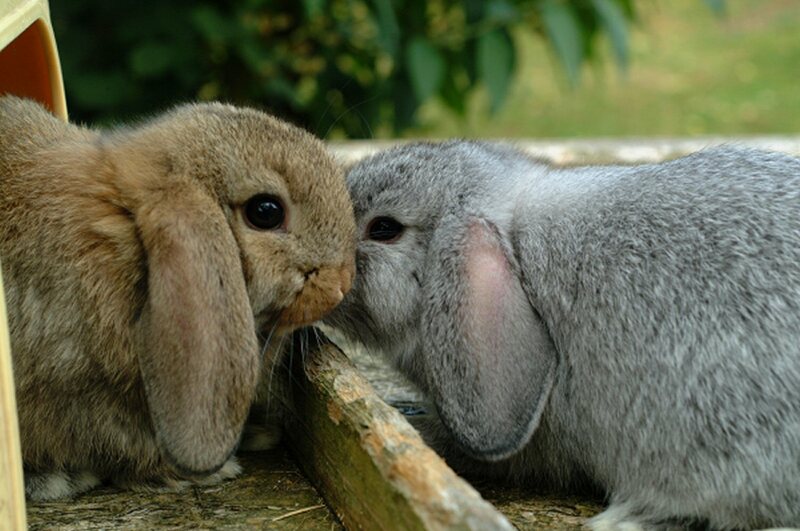 Here he is with his sister. Mother to the young otters. Mother to the otters above and daughter of the black otter above. Although black she is a chocolate carrier so hopefully useful to the otter breeding here. The work is still going on to combine the lovely deep colour of the European lines to the UK lines. Currently there are 3 chocolate otter bucks of various ages. I am eagerly waiting a litter from a chocolate otter doe back to the black otter buck. Hopefully type and colour will combine! The black otter in the photo above with her brother is an excellent mother.